The Mokuzai [木] is influenced by East and West. Traditional styling meets contemporary influences. For furniture that's timelessly inspiring. See more of our dining tables from an extensive range. Both simple and beautiful, the Mokuzai [木] table is the perfect table for the modern home. 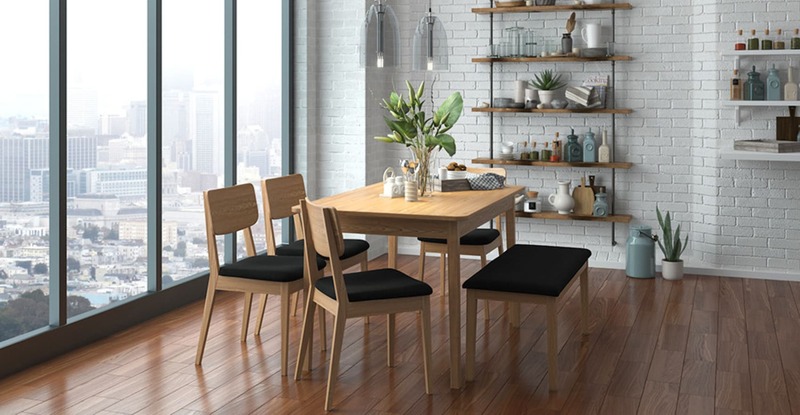 Neutral enough to match a variety of fabric and wood dining chairs, this stylish table fits with ease into any decor. Strength-tested and built to last with Engineered Wood and a thick veneered finish. The Mokuzai [木] is made for dinner parties, intimate meals and memorable conversations. Perfect for dining rooms and kitchens. Each piece can work very well on its own, but the Mokuzai [木] pieces look even better together. Mix and match from a combination of coloured benches and dining chairs to create your own unique combination, perfectly tailored to complement your home. Can you tuck the Mokuzai Bench in to this table? Beautifully designed furniture. Exceptional customer service and delivery. Great products at great prices, good delivery. Efficient, continual contact with updates, quality products. Good news! Mokuzai [木] Compact Dining Table 120cm is currently on display in our Alexandria Collingwood studio.